Day 5 was a great day. Perfect weather. Great scenery. Fun roads. And, I was a witness to several killings. Leaving the hotel I heading North from Rapid City towards Deadwood, SD on Canyon Road and then onto Nemo Road. Canyon Road was a good warm up. 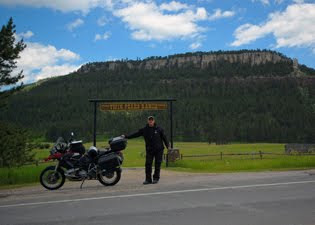 Wide sweeping turns up Black Hills National Forest. Canyon Road connects to Nemo Road that is a nice two lane twisty road continuing through Black Hills National Forest. The road drops down into a valley with splendid views. Nemo Road connects to U.S. 385 and runs into Deadwood. 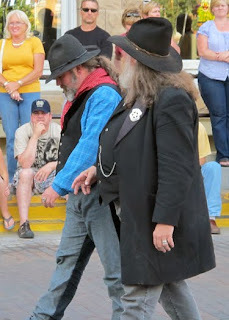 Deadwood is a real hoot. 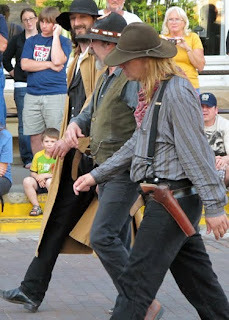 A real old Wild West town… There was an HBO drama series a few years ago about Deadwood. The show was very historically accurate, with only a bit of poetic license. 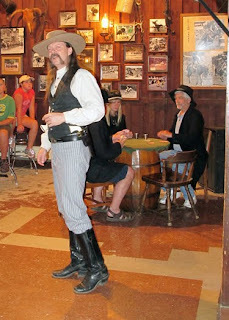 The show got my interest up in Deadwood, so I was glad to be able to spend the afternoon in Deadwood. 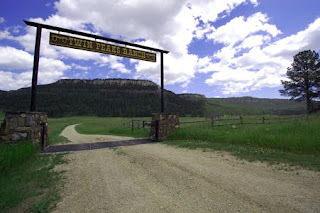 I took a nice tour, learned a lot more about the history, and stopped at the Mt. 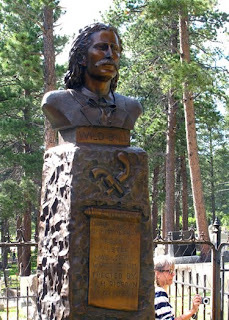 Moriah Cemetery to see Wild Bill Hickok’s grave. 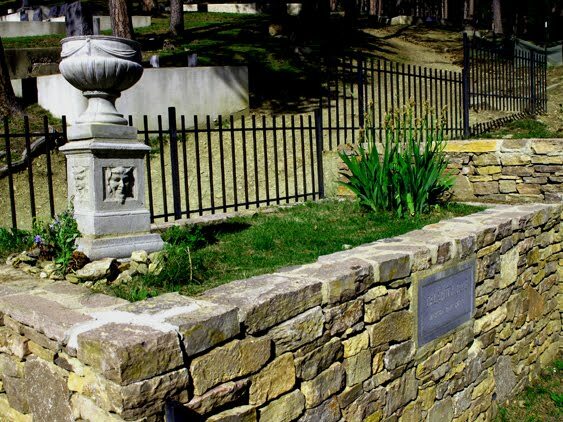 Calamity Jane's grave is next to Wild Bill. 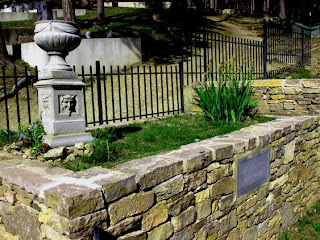 Potato Creek Johnny’s grave is next to Wild Bill and Calamity Jane. So, you probably know who Wild Bill Hickok and Calamity Jane were, but who’s Potato Creek Johnny? 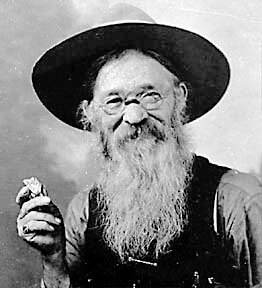 Johnny discovered the largest single solid gold nugget. The weight of the leg-shaped nugget was 7-3/4 troy ounces. 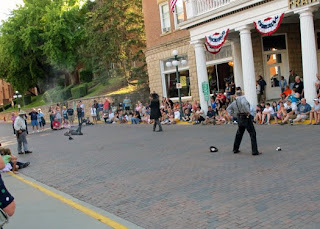 Earlier in the day I was witness to gunfight in the middle of town. 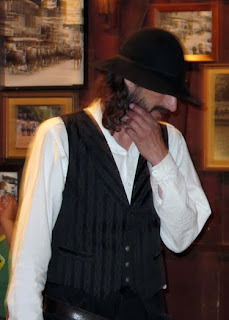 Then off to see the murder of Wild Bill by the scoundrel Jack McCall. 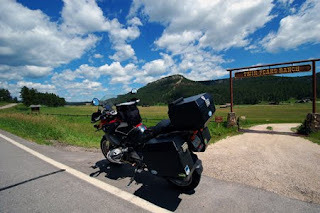 Upon leaving Deadwood I headed on to Spearfish on U.S. 14. 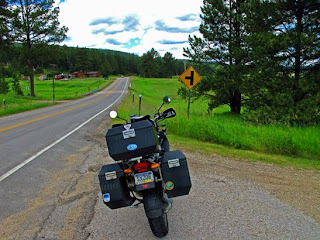 What a great road – two lane through a canyon – fast twisty turns – good road surface – good line of sight – very pretty. Sorry to say I was having too much fun riding to stop and take pictures. From Spearfish I was back to the dreaded Interstate (I-90), with a brief side trip through Sturgis before heading back to the hotel. 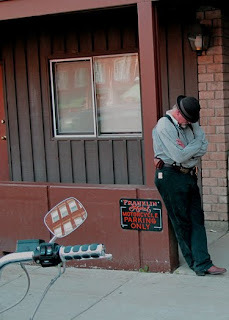 I was in Sturgis once before. 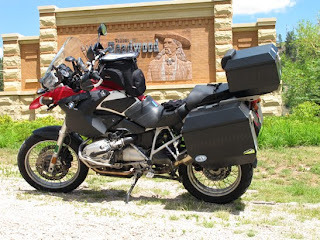 Really not much to see in Sturgis unless the Rally is going on, which was the same today so I just rode through and got back to I-90 and the hotel. Glad to hear the trip is going well. Awesome pics, keep up the great reportage!